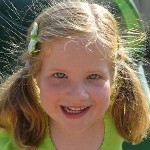 Chloe has developmental delays and neurologic and physical impairments that may be associated with an anomalous KAT6A gene identified through exome genetic sequencing. The KAT6A Foundation is seeking other families whose loved ones have been diagnosed with an anomalous KAT6A gene. We invite you to join our efforts to promote KAT6A research to find better treatments for our children, and to identify ways we as families can support our children with KAT6A mutations. Just by identifying your child, you can increase the number of children studied and the quality of research that can be conducted. If you know someone with KAT6A mutation, please contact us at: muller.jordan@gmail.com.